This review is of the show's run in 2014 at the Rose Theatre. 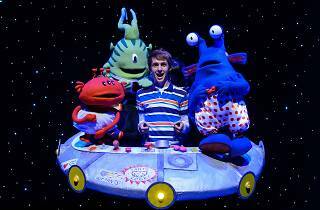 'Aliens Love Underpants' is coming to Underbelly Festival 2018 with a new cast. Forget crop-circles and abductions – according to ‘Aliens Love Underpants’, extraterrestrials travel to us from lightyears away solely to steal our precious undergarments. Adam Bampton-Smith’s adaptation of Claire Freedman’s bestselling children’s book tells the story of Timmy, a whimsical boy, whose dreams of becoming a spaceman come true when he journeys to Planet Janet. Here, human underpants are revered by aliens; the iconic hot pants of Kylie Minogue, which they’ve sneakily managed to steal, are so sacred that it would be considered blasphemous to speak louder than a whisper when in their presence. Much of the humour stems quite simply from the giggle-prone subject of knickers, and a handful of jokes are a little predictable, including announcing that ‘the show has been cancelled!’ in the opening scene. Nevertheless, the zestful charm of the four performers (Harrison Spiers, Cheryl Felgate, Charlotte Cooper and Mark Collier) and the fun audience participation captivated what might have been an easily-distracted audience of three year olds. Even the set changes between scenes were interwoven with dialogue or alien gibberish, so that the only reason I looked away was to glance at the roomful of little heads bobbing rhythmically around me during the snazzy musical numbers. Props also to designer Isla Shaw for creating a surreal, out-of-this-world atmosphere within the small Leicester Square Theatre, which involved plenty of exaggerated sound effects and an adorable miniature spacecraft, whose first appearance prompted a united gasp of delight. I almost felt sad when Timmy returned to Earth. Fortunately, the story ends with the aliens singing a heartwarming tune, reassuring Timmy that they would always stay with him – and, in a way, with any child who witnesses this memorable production. As long as humanity doesn’t plan on going collectively commando anytime soon. Loved this! Not read the book but the show was so entertaining and lively, perfect for children about 4-10. There is lots of audience interaction and it gets pretty loud at times with all of the excited screaming/laughing. Good value too and I would highly recommend it. Must be the best kid's show in London this summer! Two grandkids loved it...& so did I! Charlene Cooper is gonna be a big star - but not as an alien!